A select group of young entrepreneurs have won an opportunity to pitch their business ideas to investor Warren Buffett. The kids, who are between 7- and 16-years-old, were chosen out of nearly 4,000 entries in the online contest. The contest is tied to “The Secret Millionaires Club” cartoon that Buffett appears in to teach financial lessons. The contest is sponsored by the Fairholme Foundation and overseen by the By Kids For Kids Co. Five individuals and three teams will be flown to Omaha to present their ideas to Buffett and a panel of judges. On May 4, thousands of Berkshire Hathaway Inc. (NYSE:BRK.A) faithful will descend on Omaha for the company’s annual shareholders’ meeting. They will be there to toss newspapers onto the porch of a Clayton Home. They will be there to try on Justin boots, buy GEICO insurance, eat at Gorat’s steakhouse, wander the Nebraska Furniture Mart, and run in the Brooks “Invest in Yourself” 5k race. And, of course, they will be there to hear Warren Buffett and Charlie Munger — two of the greatest investors of our time — answer questions from shareholders and the media. …Forever is a mighty long time, but in terms of being a long-term owner, Buffett practices what he preaches. The Coca-Cola Company (NYSE:KO) and Wells Fargo & Company (NYSE:WFC) have been in Berkshire Hathaway Inc. (NYSE:BRK.A)’s portfolio for more than two decades. While Buffett hasn’t been an active buyer in Coke for quite a while, he’s added significantly to the Wells position in recent years. International Business Machines Corp. (NYSE:IBM) 8.3% face plant on April 19th following a disappointing quarterly earnings report likely didn’t set off any quaking in Omaha. Berkshire Hathaway Inc. (NYSE:BRK.A) chairman Warren Buffett just might be a little pleased that IBM retreated. After spending $10.9 billion in 2011 to scoop up 5.5% of IBM’s outstanding shares — making Berkshire Hathaway Inc. (NYSE:BRK.A) its largest shareholder — Buffett wrote in that year’s shareholder letter: “We should wish for IBM’s stock price to languish throughout the [next] five years.” Buffett’s reasoning boiled down to wanting to get the most bang for the buck as International Business Machines Corp. (NYSE:IBM) anagement continued on its long-term path of stock buybacks. Warren Buffett recently opined that bonds should come with a warning label these days. That is doubly true of most bond funds. Many investors are about to get steamrolled. But if you act now, you can avoid getting hurt. Let me explain… Historically, the best-performing bond funds have had one thing in common: low expenses.For example, Vanguard’s fixed-income funds are routinely found in the top quartile of annual bond fund performance. Why? Because, unlike stocks – where security selection is the key to outperformance – it’s tough to increase returns by picking individual bonds. I’ll concede, however, that it is possible. Warren Buffett has long talked about the virtues of businesses with “moats.” Such companies rely on strong brands or other advantages to defend their markets from encroachments of rivals. 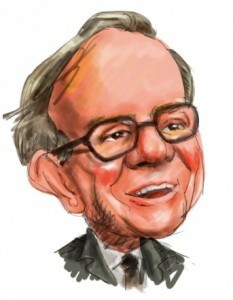 Buffett’s favorites include The Coca-Cola Company (NYSE:KO) and American Express Company (NYSE:AXP). Can wide-moat stocks outperform the markets? Maybe so. Several wide-moat ETFs have delivered solid returns. Among the most promising choices are two products that track a Morningstar index, ELEMENTS Morningstar Wide Moat Focus ETN (WMW) and Market Vectors Wide Moat ETF (MOAT). During the past five years, the Elements ETN returned 10% annually, compared to 4.6% for the S&P 500, according to Morningstar. As part of the NYSE celebration of Financial Capabilities Week, last years’ Secret Millionaires Club ‘Grow Your Own Business Challenge’ Grand Prize Winner, Aria Eppinger helped ring the closing bell at the NYSE and announced this year’s Finalists. Almost 4,000 kids ages 7 to 16 entered their creative business ideas to the competition for a chance to win the grand prize of $5,000 and an opportunity to present their ideas to Warren Buffett. The Secret Millionaires Club is an animated series created by A2 Entertainment airing on The HUB Network and with online webisodes, featuring the voice of Warren Buffett as a mentor to a group of kids as they learn important financial and entrepreneurial lessons. Microsoft Corporation (MSFT): Could Office Go Outside Windows? CEO Tim Cook: Apple- Why Tim Cook Should Remain CEO Apple Inc. (AAPL): This Samsung Speculation Is Getting Outright Ridiculous Hedge Fund Strategies & Structure: 4 Stunning Graphics GameStop Corp. (GME), Pfizer Inc. (PFE) and More: iShares Bolsters Factor ETF... Is eBay Inc (EBAY) a Buy After Missing Revenue?